We have covered so much on our DIY front about how to remove toxins, maintain our sanity with cleanliness (if we can call it that) and we have found we are saving money all the while. So here is another money saver that I truly love! While taking a queue from my love of cooking and experimentation I decided to apply that to my laundry. You see I have a true DIY laundry stain remover that my mother and grandmother and their mother’s used. This DIY laundry stain remover is the original before the fancy spray and wash. Bear with me as this will include several recipes in one share, depending upon the stain, level of soiling and or the type of stain. When my twins were born my aunt bought me this great organic cleaner called Holy Cow and I used it for everything. The make was as a degreaser but I used it for laundry, HABITUALLY! My Sous Chef and Little Bitty would make enormous messes with their clothes, generally with high staining foods: blueberries, strawberries, beets, and sweet potatoes. Needless to say that stains were a chore to remove, except when I had my Holy Cow. Until one day I ran out and my favorite store stopped carrying it and Holy Cow disappeared from my life. Double you, tee, eff. By this time though I had gone to work for the bank and my boss at the time shared about making her own laundry detergent and softener. What I never paid attention to in the year I was making my own laundry soap was that one of the ingredients is the best DIY laundry stain remover. That ingredient being Fels Naptha. Over the weekend I was sharing my love of this bar of soap to my friend at church and how easy it is to use, non-toxic and I do not find the smell or use as harsh. During our conversation an older woman turned around and asked “Fels Naptha?” and I replied “yes ma’am!” and she exclaimed how she has been using it for more than 50 years. Tickled with joy to hear others use it as well as they passed; I knew I had to share my affection for this age old laundry tool. 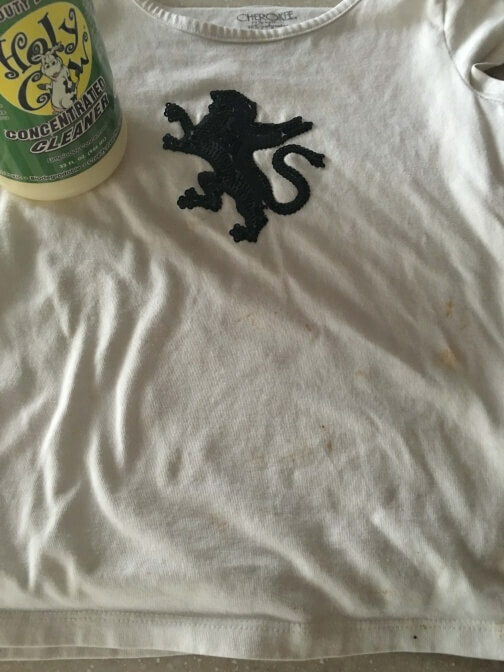 Experimentation led me to this awesome idea, if we can use a wet bar of Fels Naptha for stains, why not make it into a spray? So I shredded 1/4 to 1/3 bar of my Fels Naptha, using a funnel I poured it into my favorite spray bottle which happened to be my Holy Cow bottle. A clear spray bottle works as well so you know how much you have. Depending on how much you shred you want that to be sure to double the amount in water. Pour the water in and let sit over night. Give the bottle a good shake and VOILA! You have a DIY laundry stain remover spray that rivals Spray N’ Wash, Shout, or whatever other chemically laden product out there and for a fraction of the cost. I have even used Ivory soap when I cannot find the Fels Naptha (hint hint Christine) or a really great artisan soap from homemade soap makers. If you find the consistency is too gummy or gel like, just add more water by quarter cup increments and you are good to go. Bleach is great, but I feel like I need to use a haz-mat suit every time I use because I am fearful of splashing and bleaching other clothes or items in my house. With that in mind I have found nature to be the best at fighting stains. My grandmother who I felt was the queen of clean shared this tidbit with my mother, who passed on to me: lemon juice and sunshine. Using good old lemons from our neighbors tree and the abundance of shoveled sunshine here in Arizona I find I have the brightest whites devoid of stains. Dab, pour, drop, spray or rub lemon juice onto your nasty stain and place the clothing out into sunshine for the day. You will be surprised to find that these nasty stains have been removed from your life thanks to the power of nature. Another of natures finest stain removers is salt. I love me some salt. I found salt to be an excellent stain and spill remover, especially for wine, juices and coffee. Rather than rushing for the towels to sop up that spill, run for the salt. Salt is an excellent stain remover and absorbs all the liquid before setting into your fabrics and or carpet. Just vacuum up after the salt has dried and no stain. I also love salt for hard, grimy buildup on my stainless steel pans after cooking. Just pour some salt onto the pan right after cooking, let sit and I use less soap and less effort to remove the cooking buildup. What are some of your favorite DIY tips and tricks? What do you use that are everyday household items that keep your laundry from harboring stains like a grudge or that make life fancy free for your pocketbook? I’d love to feature you and your recipe. Love your old time pictures of a woman doing laundry! I worry about using bleach on my clothes…thanks for the information. I have had a bar of Fels Naptha up on a shelf in my Laundry room for about 10 years now after reading this I am finally going to put it to good use! Great info! I use Fels Naptha in my homemade laundry soap but I hadn’t thought of using it to pre-treat stained items. Now I will as I have a few bars in the cabinet. Also love the tips about the lemon and the salt. I’ll be trying the salt out with my grimy pans. Great suggestions. So much safer than bleach. I like the fact that you have a choice of using the Fels Naptha bar wet or dry. 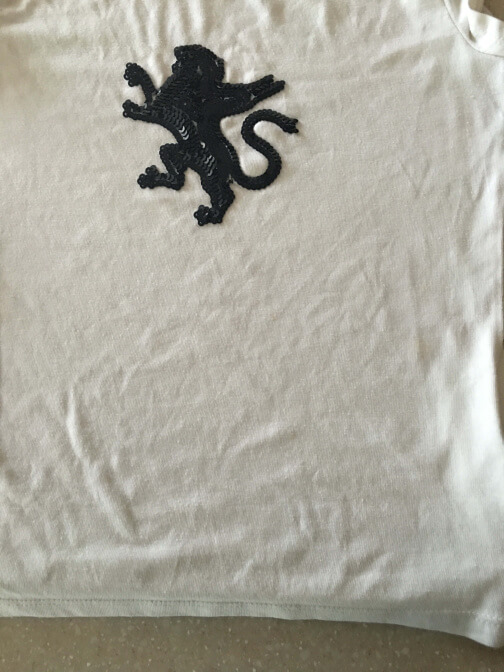 If I am not washing the treated clothing right away, I hate for it to lay around wet but I can treat it with the Fels Naptha bar and not worry. I’ve heard of a Fels Naptha bar but never used it or really knew how to use it! Thanks for the heads up. I have a bar of Fels Naptha that a friend gave me and it’s sitting in my laundry room cabinet. Now I know what to do with it. Thanks. my dad swears by this! he always gives me some! Thanks for this post, I am trying to get rid of toxins in our life. My mother used Fels soap on clothes and floors and everything would come up so clean. We are talking 50 years ago. I didn’t think it was still around. I will be looking for it. Thank you for a wonderful review. Great article I’ve used this but not all these ways thanks for sharing. Love Fels Naptha! Great post! Thanks for sharing! I have never heard of this product but will definitely have to try it! I love pre-treating my dingy clothes to give it an added lift. This product sounds fabulous to use just for that. Thanks for the review! I do pretreat my whites, this may help. Thanks . This would be so great for us. We acquire some pretty serious stains on our clothing, on a regular basis. Thanks for a great tip! I haven’t seen Fels Naptha in bars in a while but I hadn’t looked. My fave tip is to fill a spray bottle about 1/8 full of liquid fabric softener, then fill the rest of the way with water. Give it a shake, then spray onto a dedicated washrag that stays in the dryer. Spray each time you run the dryer and it will keep you from needing dryer sheets. No static and fresh smelling laundry! Costs pennies to use! I am loving your toxin free posts. I especially love this toxin free stain remover. With three little kids, I definitely need this in my life! Thanks. Thank you so much for posting this. I had no idea that something like this even existed! You learn something new everyday. 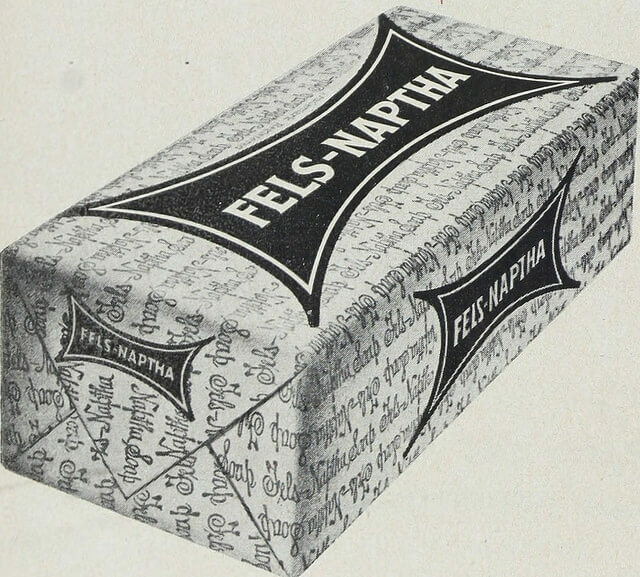 I had never heard of Fels Naptha before. It sounds like a great stain remover. I am going to try it. This is a nice and organic recipe to help on saving the environment. I appreciate the information on trying to save thew planet. I like that this is natural. I’ll have to try it out. I had a couple stains the other day that were SO difficult to get out! Thanks for this post. I had no idea you could make your own stain remover at home. Natural is the way to go. I have heard of Fels Naptha, & my Grandma used it. But I have to admit I’ve never tried it myself. I’ll have to get a bar & try it. I was actually thinking of this new year to start making my own laundry soap because no matter what soap I buy , my skin has been breaking out. i need to find this, stains are always around with 9 kids. We made our own laundry soap and used the Fels Naptha. I liked making my own laundry soap. I keep a bar of Fels Naptha on my laundry shelf. Fels Naptha is a proven stain remover economically priced (who could ask for anything more?). I need to buy Fels Napatha! Thanks for the great post, I am going to have to get me some Fels Naptha, thanks for sharing!! 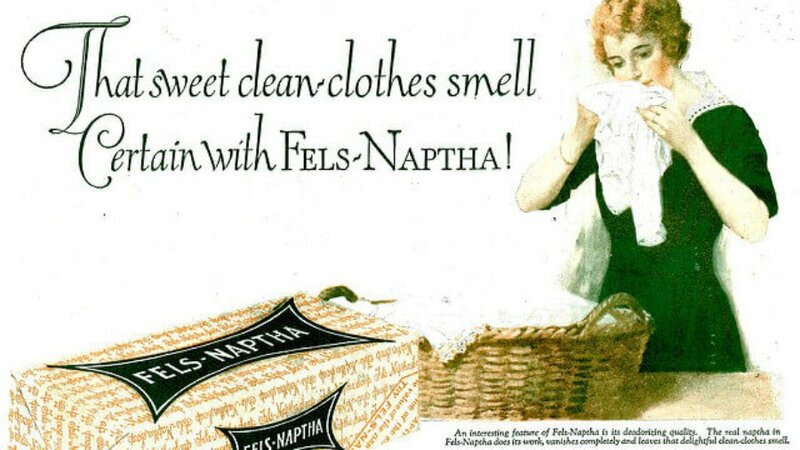 I vaguely remember the name Fels Naptha but it was years ago. I am so glad you shared this! I am going to look for this next time I am at the store. We all need to find cheaper alternatives & ones that are chemical free these days. Thanks !! I will have to remember how useful salt is for stains!